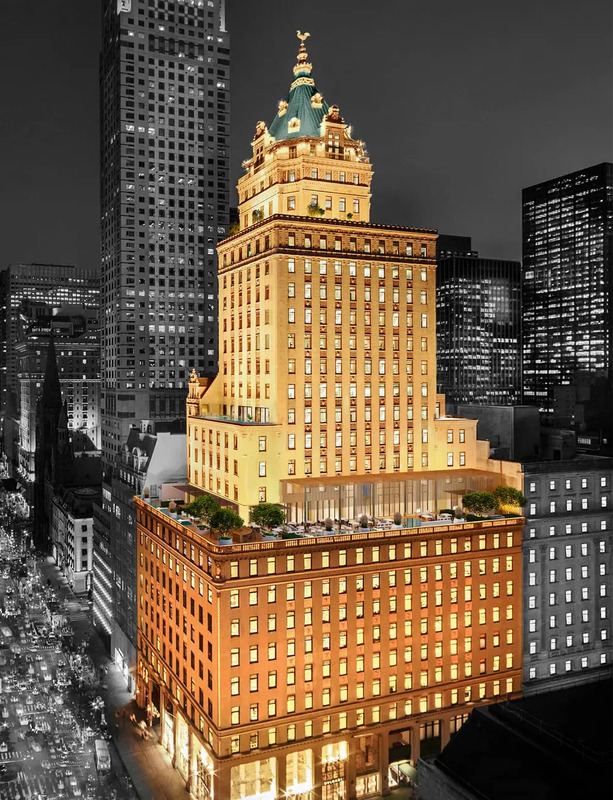 Nearly four years after Aman Resorts CEO Vladislav Doronin purchased the fourth through twenty-fourth floors of the historic Crown Building for $475 million in 2015, new renderings have appeared for what will become Aman New York Residences. 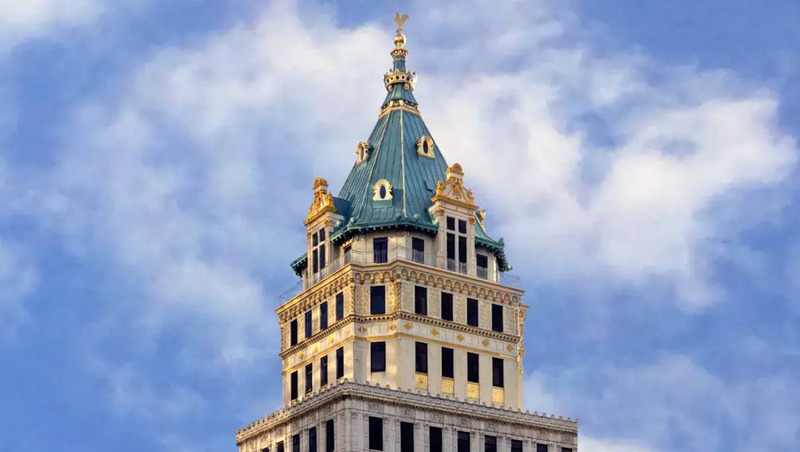 OKO Group is at the helm of the project, and architecture firm Denniston is restoring the building to its former grandeur while transforming the interiors from office space to high-profile hotel rooms and condominiums on one of the city’s best blocks. Above the Bulgari flagship at grade level, floors 4-10 of the historic building will be devoted to 85 hotel suites with minimalist furnishings, discreet white-glove staff, and a plethora of amenities: The seventh through ninth floors alone have been set aside for Aman Spa, which will feature a state-of-the-art gym, private Spa Houses, treatment room, sauna and steam rooms, 25-meter indoor pool surrounded by fire pits and daybeds, and an outdoor terrace with cabanas, daybeds, and fireplaces. Further hotel amenities include a subterranean jazz club, a piano bar, a cigar bar, and a wine library. 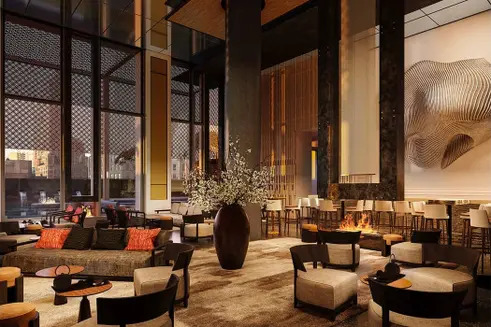 Moreover, while the building is a short walk from some of New York’s best restaurants, guests and residents need not leave to experience fine dining. 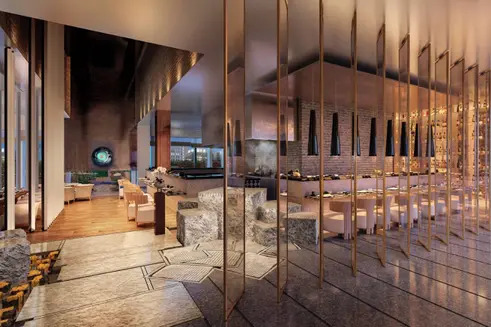 Nama is Aman’s interpretation of the Japanese washoku dining tradition, and Italian restaurant Arva will have seating on an outdoor terrace overlooking Central Park. 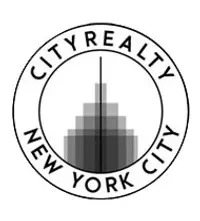 Starting on the 11th floor, residents of 20 apartments will enjoy access to the hotel’s amenities, not to mention stunning city and Central Park views. 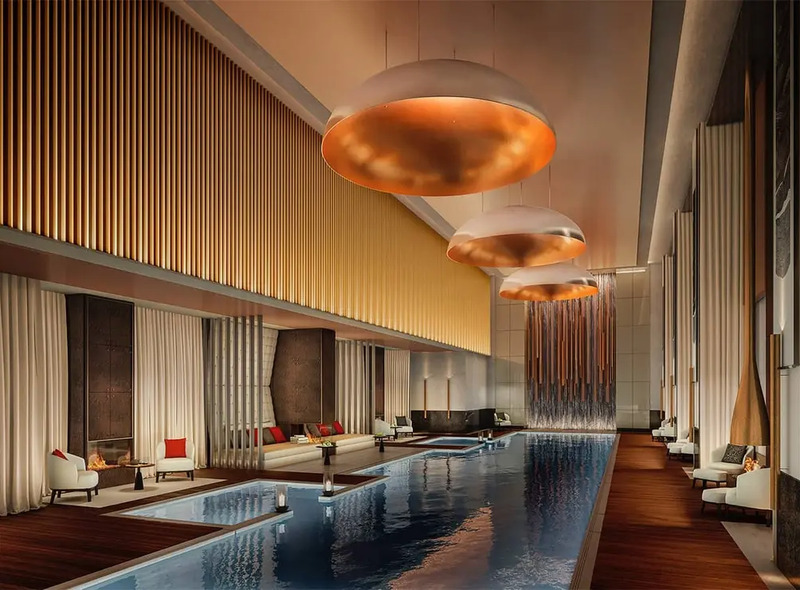 This is especially so in a five-story penthouse with piano lounge, wraparound terrace, and two swimming pools that sold for a then-record price of $180 million last spring. Additional prices are not yet available, but an accepted offering plan lists a whopping $893 million sellout. To the relief of architecture enthusiasts everywhere, these glitzy new additions do not come at the expense of the historic Crown Building. The development team is committed to restoring the building’s existing façade, and that includes recreating a 10’ rooster weathervane that was originally at the top of the building but removed in 1942 as part of the war effort. The Landmarks Preservation Commission welcomed this news and allowed construction to begin in 2016. 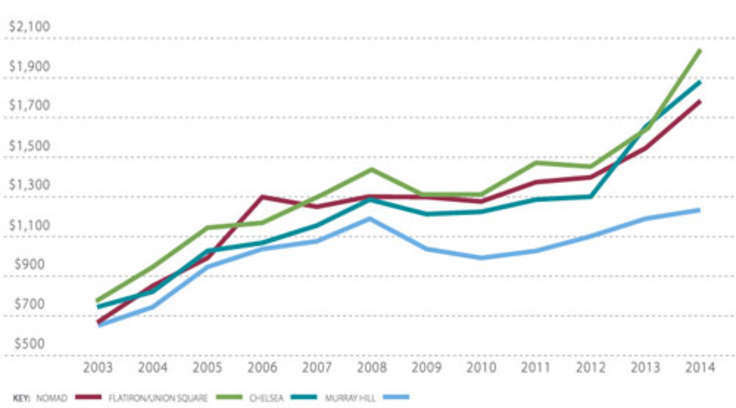 Opening is estimated for the fourth quarter of 2020, just ahead of the building's centenary.